In 1967, after a fairly strong air-pollution-control measure died in committee, a replacement bill, actually proposed by a Union Camp representative, sailed through the legislature with only a few changes. The new law authorized only such pollution control as was “consistent with providing for maximum employment and the full industrial development of the state” … . Once again, this sounds familiar, as states continue to deregulate and offer tax advantages in an effort to attract business, other costs (forgone revenue, declining support for schools, eventual need to clean up environmental disasters) be darned. A bill to streamline Wisconsin’s mining permitting process appears destined for passage after the state Senate approved a bill and sent it to the Republican-controlled Assembly this week, despite Democratic criticisms that it rolls back environmental protections and is a giveaway to mining businesses. The legislative efforts this session follow a failed attempt to pass a similar bill last year, which would have lured Florida-based Gogebic Taconite to begin a $1.5 billion mining project in northern Wisconsin. With numerous groups already vowing to challenge the bill in court, Sen. Tom Tiffany also acknowledged that changes were made to the legislation to put the state on stronger legal ground to withstand such a challenge. Bill Williams, present of Gogebic Taconite, which is proposing a massive iron ore mine in Ashland and Iron counties, said in a recent Wisconsin State Journal article that as much as 30 to 40 percent of the 3,300 acres it is leasing could be covered by waste piles if it builds a $1.2 billion open-pit iron ore mine. The land above the rich vein of iron ore contains hundreds of acres of wetlands, numerous pristine trout streams and several small tributaries that feed into the Bad River. The Bad River wends its way to Lake Superior through the Bad River Indian Reservation, which includes culturally and economically significant rice beds. In a legal context, the wording change proves lawmakers knowingly passed a bill that they accepted would cause some harm to the environment, Tiffany adds, making it more difficult for a lawsuit to be successful on the grounds that a mining permit caused harm to the environment. This is contemporary Wisconsin, mind you, not Depression-era Georgia. And a Republican Party determined to turn back the clock. There may be stalemate in DC, but at the state level, radical change is underway. 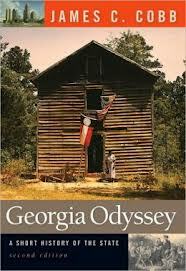 Good book, by the way—Georgia Odyssey. I finished it this morning.